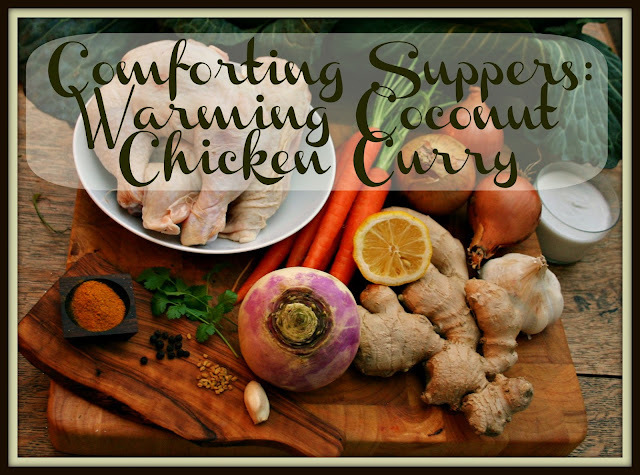 Tonight, I made Ariana’s delicious “Warming Coconut Chicken Curry.” I’ve been meaning to make it for almost a week now, and I’m so glad that I did. I altered her original recipe only slightly by adding a dash of cayenne and a parsnip. I really enjoyed trying a different type of curry than I normally cook. And I was glad to have another great chicken recipe. This meal only took me twenty minutes to prepare and set to simmering, 45 minutes to simmer, and then 5 minutes to eat! Just kidding, I took my time with this one and savored every bite. Mmmmm…. We took Ariana’s advice and ate it over wide cabbage ribbons that I sautéed for one minute in butter and black mustard seed. Some pictures of how it turned out are below. Click here for Ariana’s recipe! I had hoped it would make you smile! :) We really enjoyed it!